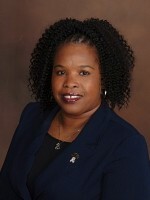 Tania Y. Griffin - First Realty of LaGrange, Inc. I started my real estate career in 2004, servicing the Atlanta and Metro Atlanta area. Prior to real estate, I served my country in the United States Army earning the title of Administrative Specialist. I also served in Desert Shield and Desert Storm. I am a proud member of the American Legion Post 75 here in Lagrange. Throughout my Army career, I have traveled overseas and within the United States and I know one thing, people respond to how you greet them, treat them, and communicate with them. This has been a personal goal to treat each individual the way I would like to be treated. I have been married to Kervin Griffin for five years and together we have four children. He works as a Cell Leader with Kason Industries in Newnan, GA and also works part time as Security for Brickhouse Grille in Lagrange. We also own KD’s Fish & Wings food trailer out of Grantville, GA. I am currently serving as member on the Troup County Board of Realtor’s Community Service Committee and the Membership Committee. Real Estate has provided the opportunity to get involved directly into the community, it has given me skills to build relationships, and develop long lasting friendships. My past experiences as a soldier has given me the tools to be disciplined, determined and committed to whatever the task is at hand. These are the same qualities that I can provide to you. I would love to be your REALTOR®!